Way of the Roses — Another ‘Way in a Day’! Another ‘Way in a Day’! The Way of the Roses has been on my 'to do list' for some time now, living near to the route in Settle and having a love for long adventures I have always wanted to do it as a 'day' ride. So I gave it a go one Friday in July. Getting dropped off in Morecambe I was greeted with heavy showers, but the forecast was an improving one. Starting out at 07:15, I was soon enjoying the cycle paths through Lancaster, being rather cautious as they where very slippery in places and I actually had a 'small' off, which I took as a good warning. I was soon in Settle and had a quick re-fill of the bottles and some cake, with the weather improving the riding over the tops to Pateley Bridge was enjoyable and helped by a prevailing wind. Dry roads, sunny and warm in Ripon and all the big hills done, it was time for a bottle refill and a nice change to be zipping along the flat Vale of York. Joining with the River Ouse near York began a pleasant series of cycle paths that weaved through the city, which went right past the magnificent York Minster (a real highlight) - but busy with people and lots of turns meant being vigilant is key to not getting lost, or bumping into a pedestrian! After York the route unexpectedly went 'off road' for a couple of miles, this was great fun through fields of poppies, but meant riding 'gingerly' with the delicate race bike wheels - but no problem. The flat continued on to Pocklington and I was in a part of Yorkshire I had never before visited. Starting to rise I headed through the 'Wolds', some stunning scenery and views a far from the top towards the East - but still no sea in sight! The ride went on along quiet lanes through sleepy villages and eventually after the pretty town of Driffield the sea was in view - not far now! Soon heading through the old town part of Bridlington, the signs said 2 miles to go, still feeling okay I pressed on the pedals, keen to do it in under 10 hours I arrived at the North Shore finish at 17:07, 9.52 hour coast to coast, with just 7 minutes of stops. All went well, the route was varied, interesting and exciting and was well marked and deservedly popular. My route log is on Strava - https://www.strava.com/activities/634239467. If I do it next time, I will do it over a couple of days and plan in a few more stops maybe! 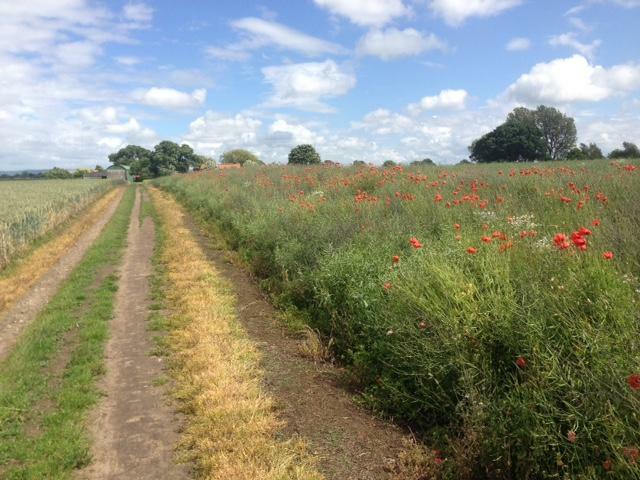 (Photo above, 'poppy fields' shows the only stretch of rough off-road section on the route (about 1 mile) just after Dunnington east of York not too bad in the dry! ← The Way in a Day!